I’m not totally sure, but I believe there are more Civil War memorials, battlefields and other historical attractions in the Commonwealth of Virginia than anywhere else in the United States. 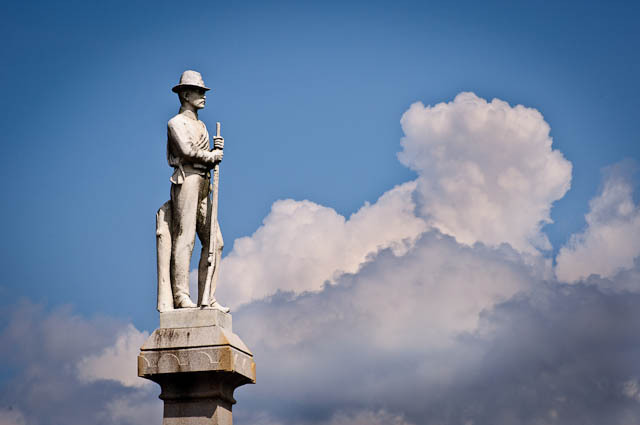 Every time I visit the old Court House in Martinsville near where we live, I have to admire the large Confederate Memorial pillar on the front lawn, with the soldier standing watch. In this case, he’s watching some pretty nice puffy clouds, which added a lot to my photo…in my opinion that is. Nikon D300 processed in Lightroom 3. Did you add the background? Or retouch it? I like this shot, but seems that there’d be buildings or trees in the background. What you see is what I saw. I took this with my 300mm telephoto lens, standing across the street from the courthouse (on the left), looking up. That location gave me the clean background except for the nice clouds present that day (last Sunday).